The Merida T-5CES belongs to the Trajan Series, named after the Roman Emperor, and evokes the characteristics of this poignant figure of the past; being both powerful and dominant with it’s combination of a cedar top and mahogany back & sides. Being the electro version of the T5, the Merida T5CES features Fishman OEM ISY-201 electronics. Along with allowing you to hook up to an amp, this addition gives you a helpful set of controls to alter your tone straight from the guitar with its volume rotary knob, contour and phase switches. There is also a built-in tuner function, with an LED display to show your current tuning and indicators of whether your tuning is sharp or flat. The Merida T5CES Electro Classical Guitar also differs from the T5 by its cutaway body shape, allowing access to the upper frets. Beautiful to look at, as well as to play, Merida have made sure that the aesthetics of both wood types used to construct the body of the Merida Trajan T 5CES are shown to full effect, with the brightness of the cedar offset nicely by the dark hue of the mahogany. Mahogany is used for the neck also, with dark aesthetics continuing with the addition of a pau ferro fingerboard and a unique dark fronted headstock, brandishing the Merida ‘M’. Tonally the Merida Trajan T5CES sounds great with cedar offering up a clear, loud and bright tone and the mahogany back & sides accentuating this further, as well as bringing the mid range out a little more, so you don’t have to play hard to be heard. 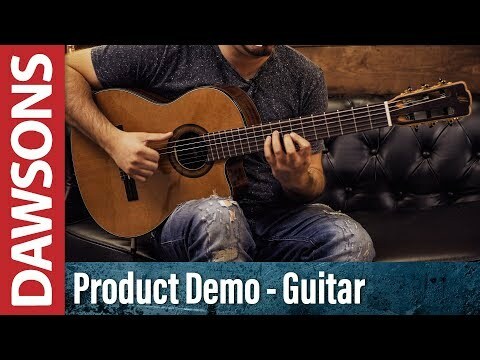 The Merida Trajan T-5CES Electro Classical Guitar is set up perfectly with a set of tuners crafted by Der Jung, whose fifty years of manufacturing guitar machine heads sees them being relied on by Yamaha, among other big names. Posted on 15/03/2018 by Jon Owned for 18 months now, and played it almost every day since then, including many acoustic gigs. Looks amazing, plays effortlessly, sounds fantastic and has never let me down on hardware either. The pickup system battery lasts ages and sounds warm and full. Responds excellently to my fav D'Addario strings. Absolute bargain. Posted on 06/09/2016 by Paul Great tone. Great action. Super good price. I'm in love. Been playing for 56 years. Played every brand out there. This is a keeper.